The BC Early Hearing Program works towards achieving the best language outcomes for all young children in BC. The BC Early Hearing Program (BCEHP) is the province-wide screening program to check hearing for babies born in BC. The program provides integrated services from hearing screening to hearing testing as well as early language support following identification of hearing loss. Babies say their first words around one year of age. By preschool age they usually know more than 1,500 words and begin telling stories. These early language skills serve as a foundation for learning in school. Early hearing screening is important. When a baby is born deaf or hard of hearing, the process of developing language can be delayed. Early screening helps reduce this delay by identifying children with hearing loss and providing their families the support and professional care they need. Even if no one in your family has hearing loss, it is important to have your baby's hearing screened and to attend any recommended further hearing testing. About 1 in 500 babies is born with hearing loss. This number increases to 1 in 50 for babies who have complex health issues at birth. 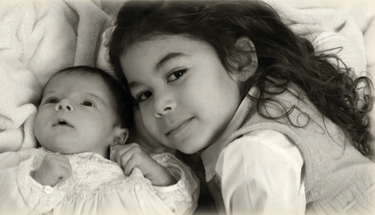 Most babies who are deaf or hard of hearing are born into families with no history of hearing loss. 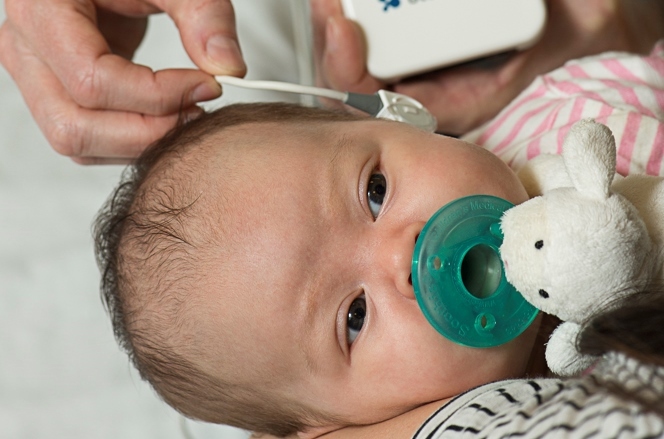 See our Hearing Testing section for information about newborn hearing screening and hearing testing for infants and children. 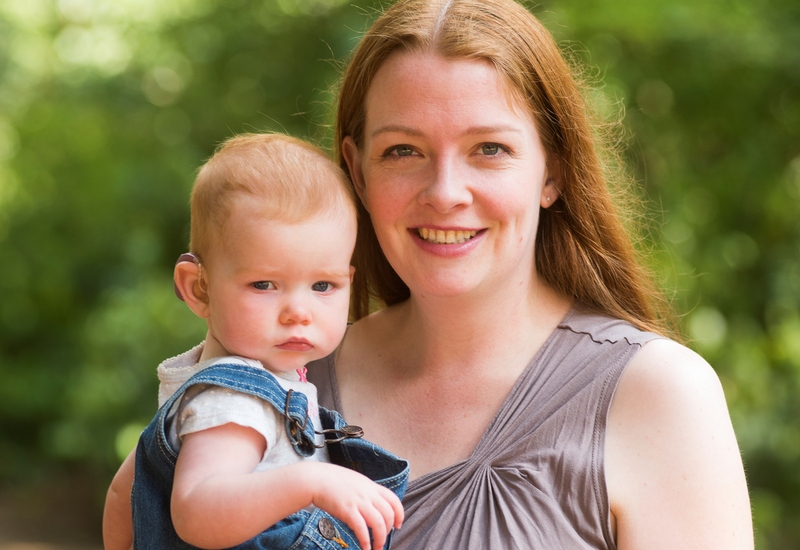 If your baby was recently identified as deaf or hard of hearing, you will be contacted by a BCEHP Service Coordinator about early language services available. These services will provide you with the information and support you need to help your baby develop early communication skills. If your child has been identified as deaf or hard of hearing, there are many resources available to help you learn more. Early services will be provided by a variety of team members working with you to support your child’s development. Babies’ brains are programmed to start learning language from the very beginning of their lives. Early months are critical learning times for your baby. It's important that you are able to communicate with your baby as soon as possible. Early intervention service providers will be able to give you more information about your baby’s early communication. They can help you learn ways to take full advantage of play and home routines (for instance, changing diapers and feeding time) to stimulate language. Understanding how to help your baby’s language develop may prevent delays and reduce any frustrations for your baby with communication and social-emotional growth. Effective early language and communication may include spoken language, sign language, or a combination of visual and listening opportunities. No one communication approach has been found to work best for all children. Parents and family are the most important members of the team. Your involvement is vital. Work with your early intervention provider and audiologist to discover what communication opportunities are available. The most important thing for your child’s development, and for your relationship with your child, is being able to communicate. You may find it helpful to read about other parents' early intervention experiences. 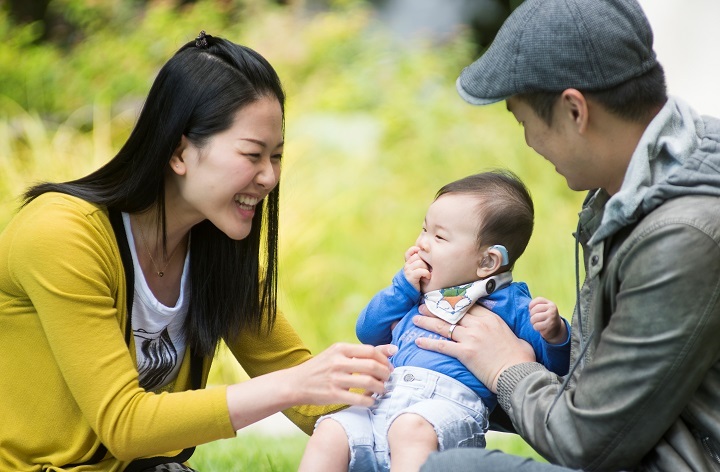 Our Guide By Your Side service connects you with another BC parent of a child who is deaf or hard of hearing. Some professionals will see you and your child regularly, while others may serve the role of a consultant; working with you and your child on a less frequent basis. In addition to the Audiologist and Speech-Language Pathologist, Teacher of the Deaf/Hard of Hearing, or Listening and Spoken Language Specialist, your child’s team may include physicians from the fields of otolaryngology and paediatrics. For some families a larger team of professionals may be involved in supporting your child’s development including, Infant Development Consultants or Aboriginal Infant Development Consultants, Occupational Therapists, Physical Therapists, Vision Consultants and Sign Language Instructors. In some teams, a Social Worker may be available to provide support to your family. The service providers offer opportunities for your family and support your choices leading to your child making optimal development. They consult with you and other team members to understand all of your child’s and family’s needs. Planning meetings involving the whole team, including you, are essential for early intervention teams. Trained Deaf and Hard of Hearing Guides & Parent Guides from BCEHP’s Guide By Your Side program are available to give helpful tips to you about working with your early intervention service providers. See our tỷ lệ kèo trực tuyến Early Language Support and Stories from Families sections for more information. For families outside the Lower Mainland (or further east in the Upper Fraser Valley area), the primary provider may be a Speech-Language Pathologist (SLP) working for Health or for a Community agency. Families may contact specialized agencies to find out current information on what is available for their family and community. Consultation and in-person visits on an outreach basis for those families and community service providers may be recommended. Involvement of specialized agency services and coordination with community based services meets international best practice standards for children who are deaf or hard of hearing. A BC Early Hearing Program Service Coordinator can also offer assistance with recommended services and next steps. The BCEHP collects your baby’s personal information as authorized under section 26 (c) of the BC Freedom of Information and Protection of Privacy Act. Most often, information is collected by staff members at the hospital or centre where you receive services. Information is also received from other health facilities and practitioners that participate in your child’s care. This information is transferred electronically to BCEHP’s database system, called BC Early Hearing Surveillance Tool (BEST). Personal information is stored in a secure manner. The BCEHP uses an information system called BEST to provide the information link between hospital screening, community services and doctors, to support direct patient care, program management and research related to early hearing loss in BC. The system keeps personally identifiable health information about the services and treatments your baby receives. Who has access to my information and how is it used? BEST data is primarily used to provide care wherever that occurs to — in a home, in the community unit or in a hospital. Those participating in your care are allowed to see your personal information. Strict controls are maintained to ensure only those who are actively treating you have access and to only what they need. Data that does not identify a specific baby is used for administration of the BCEHP improving services, education and research. Data may only be used for research if it meets strict legal requirements. All research requests are reviewed by the BCEHP Research Committee and the data steward before any data is disclosed. Data used in research and education projects supports positive changes to patient care and better health outcomes. What steps are taken to protect privacy? BCEHP has policy and processes in place to protect privacy. Anyone who accesses BEST data must protect your baby’s information (electronic or paper) from inappropriate or unauthorized use and disclosure. Measures include the use of frequently changed passwords, security for electronic transmission of data and physical security. Staff members sign confidentiality agreements and receive training and supervision to ensure they understand their responsibility. They must maintain the confidentiality of your information even if they no longer provide care to your baby. In what cases is personal health information disclosed? BEST data is disclosed on a need-to-know basis for care of your baby or where permitted by law. Disclosures are based on the law, best practices and professional ethics. Disclosure for research is subject to specific law and policy. Where the BCEHP purchases hearing aids for the child the audiologist at the local clinic will order the hearing aid(s) directly from the manufacturer. The audiologist will ask you to complete a consent form to disclose your child’s personal information (including date of birth, name and audiogram) to the manufacturer of the hearing aid. This information is needed to register and activate the hearing aid warranty and to help choose the best model of hearing aid for your child. Information is kept for seven years beyond the time of last contact, or in the case of minors, for seven years beyond the time that the individual reaches their age of majority at 19 years. How do I access my personal health information? Throughout your baby’s care your health-care team will communicate with you about the services your baby is receiving. You have the right to know what information is kept about your baby, to see it and to correct it. You can request information at any time. The BC Early Hearing Program (BCEHP) is a service of BC Children’s Hospital and the Provincial Health Services Authority (PHSA). The Program provides coordinated, accessible early hearing screening, identification and intervention and early communication support services for babies aged birth up to five years of age who are deaf or hard of hearing, and their families. For enquiries, or if you are having trouble arranging a screening, contact the Provincial Office of the BC Early Hearing Program. Email: bcehp@ tỷ lệ kèo trực tuyến www.eagleslocker.com?? ?